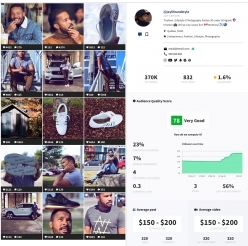 Get a better visibility for your products by letting influencers promote your store and increase your revenues with influencer marketing. 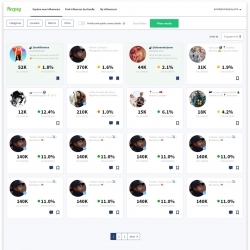 Heepsy is the best influencer marketing tool for retailers looking to have more visibility for their services or products. 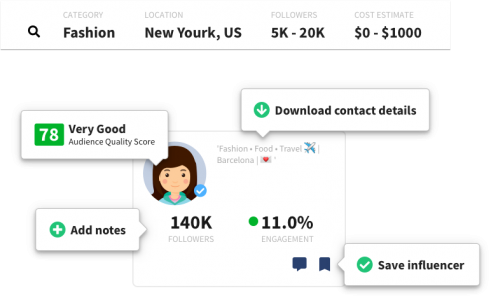 With Heepsy you can discover, analyze and reach out influencers in your area that can try your products and show them to their followers. Contact influencers and offer them free products. Triple your brand exposure by using influencers on your campaigns. Launching a new product? Invite influencers to try your products before they are available in stores. Get customers excited and increase your revenues. Look up the best influencers that will align with your brand and values. Use our filters and offer them a collaboration. Check the best influencers and save them in lists. Get in touch with them and offer a collaboration that will increase your brand awareness. Go to our search tool and use our filters to find influencers in your niche and location. Obtain the best fit for your store in a matter of seconds. 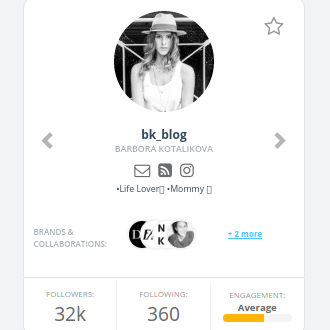 Check if the influencers have good engagement, what is their estimated cost for their posts, what products they have been mentioning and much more. 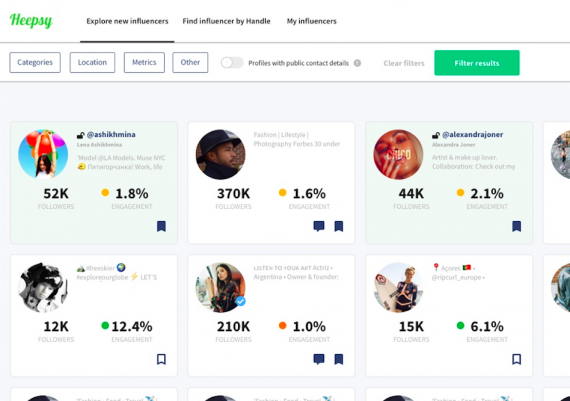 Heepsy is the perfect influencer marketing tool for retail marketers looking to acquire influencers for collaborations and product placements. One of the most common concerns for marketers doing influencer marketing is how to find influencers that are aligned with your image and embody your brand’s values. At Heepsy we have a many social media users where you will no doubt discover the perfect influencer for you. No matter how niche your target audience is, with our advanced filters, Heepsy lets you identify the best influencers in any location and category for your store. Now you might be wondering how to do collaborations or how to promote your products with influencer marketing. We have found the best method is sending free products to influencers for review. Here, the most important thing is to make sure that the influencers you choose are a great fit. Pick someone that could actually be a customer of yours, try to give influencers product they will love. 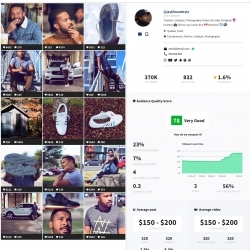 Depending on their reach, you will see that some influencers (usually the ones with the lower reach, the so-called micro influencers) will be willing to accept your product as their sole compensation, while others will require an additional fee to feature your brand in their media. Why should I use an influencer search tool for promotions instead of an influencer marketplace? 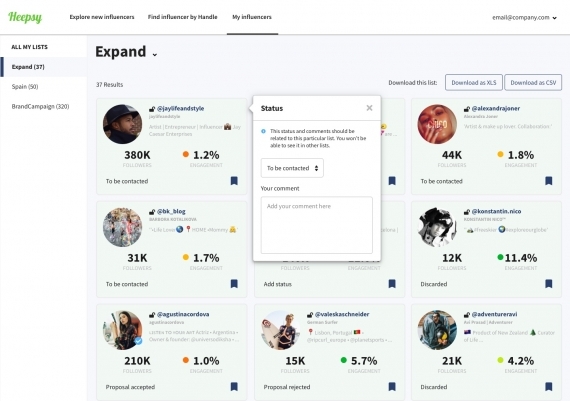 Many influencer marketing platforms have in an opt-in model that gives you access to contact only the influencers that have decided to sign up on their website. However, the only thing that influencers need to be on Heepsy is having a social media account of 5k followers, no signup is required. 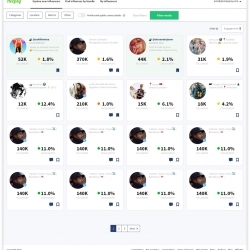 Influencer search websites like Heepsy let you access the whole influencer universe! Copyright 2019. All rightsq reserved.